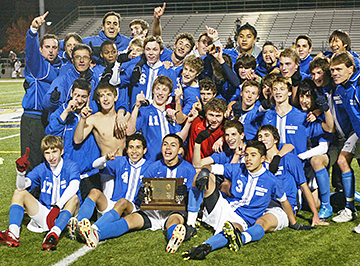 MISSION ACCOMPLISHED: Members of the Princeton High boys soccer team celebrate last Friday night after winning the Group III state championship. PHS edged defending state champion Millburn 2-1 in the title game to end the season at 21-0-4 and win then programs first state crown since 1995. For more details on the game, see the front page story. When Allen Bryant started his Princeton High sports career in 2006, he envisioned himself as a future football star. But after suffering several concussions on the gridiron as a freshman, Bryant switched to soccer. Bryant competed for the PHS JV boys team the next two seasons, playing goalie as a sophomore then moving to defense in 2008. This fall, the athletic Bryant, who also stars in track and lacrosse, moved into the starting back four on the Little Tiger varsity squad. At last weeks meeting, the Boroughs Zoning Board of Adjustment unanimously approved J. Robert Hilliers application to redevelop his property at 190 to 198 Witherspoon Street. The Recreation Department has approved the creation of a Princeton Parks and Recreation Foundation, charged with improving the quality of life for the diverse population of Princeton by promoting and implementing recreation, parks, conservation, and leisure services in a thorough and financially efficient manner. The group was established out of the departments recognition that it cannot rely exclusively on public money to reach the goals outlined in its 2008 Master Plan. A new Historical Society of Princeton (HSP) walking tour launched last week reveals palpable traces of the past in the everyday. Discussion of the Universitys plans for an arts and transit neighborhood and passage of an ordinance concerning the Shade Tree Commission highlighted Monday evenings Township Committee meeting. A Leaf Management Committee that will address leaf collection and storm water management in the Borough and the Township was created during last weeks Princeton Environmental Commission (PEC) meeting. The group also plans to launch a Home Energy Audit Project in collaboration with Sustainable Princeton. For Princeton University cross country star Liz Costello, the NCAA cross country championship meet in 2007 marked a nadir in her superb running career.